You've filmed your video and uploaded it to YouTube and now you're ready to see your YouTube views climbing. Except you're stuck. You feel like you're doing all the right things and for what? Crickets! 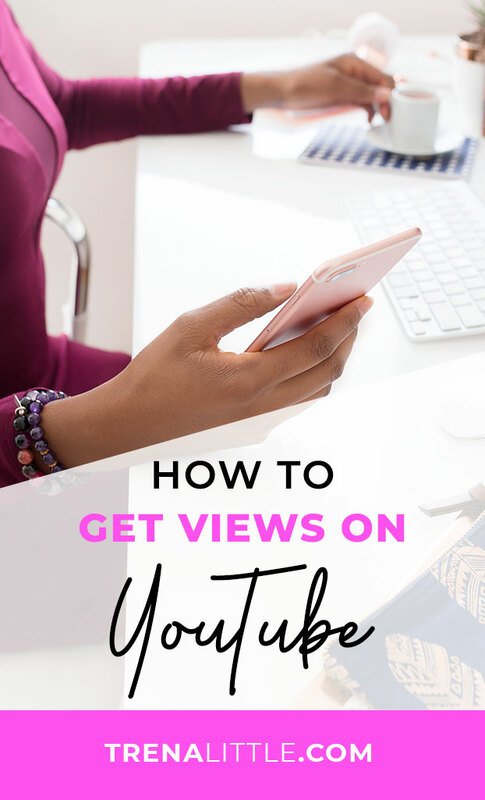 In this week's video, I'm going to be sharing with you how you can get more views on your videos now. Use a program like Photoshop, Canva or PicMonkey to make a thumbnail that will grab people’s attention. You will also want to make sure it stays on brand with the rest of you business. You can link your Twitter account to Youtube. Doing this will allow you to automate a Tweet whenever your video goes live! You can put in a custom message and hashtags to get people over to watch you video. Another added bonus of linking your Twitter account is whenever someone shares your video through Twitter, your Twitter account will be added to the tweet. This gets your name out there and more people clicking on your account to see what you are all about. And possibly generating new Twitter followers and video watchers! The best way you can get your video watched is to promote it like crazy! Don’t just upload a video to Youtube with the idea, “If I build it they will come.” Most likely, not going to happen. So shout it out to the world that you uploaded a new video! I like to post my video on Twitter at least 3 times a day, sometimes 4 or 5. Most people won’t catch all the times you promote your video on Twitter so promoting it 4 or 5 times won’t get annoying. I also like to post a 15 -30 second teaser clip of my video to Instagram and Facebook. I like to add subtitles too because audio doesn’t automatically play on videos in Instagram and Facebook. In Instagram I will change the link in my bio to be the link to my latest Youtube video and on Facebook I will add the link in the description and tell people to head over to my Youtube channel to watch the entire video. My biggest Youtube view secret is Pinterest! Now if you share your video on Pinterest from the Youtube platform, it will create a very small unattractive pin that won’t get much traffic. What I have been doing is making a pin just to upload to Pinterest! I will add keywords to the description and a call to action that tells people to click through to watch the video. My pin will then link to the Youtube video. After doing this strategy for about 3 months now Pinterest has now become my number one Youtube traffic source! Collaborating with people is a great way to get more views! They will be excited to tell their audience they are being featured on your video. You could interview them through Google Hangouts and share it on Youtube. Or get them to send you a video file and you can add it to your video. This is what I do on my Youtube channel. Not only do I get to know my fellow entrepreneurs a little more and learn some great tips from them, they are sharing my video with their own audience! You might think this is a little redundant, but the thing is people who are subscribed to you email list might not be subscribed to your Youtube channel or even know you have a Youtube. They also might have their Youtube notifications turned off so they will never know you’ve uploaded a video. Just shot them a quick reminder that you just uploaded an awesome new video they should totally check out! You can’t actually email the video so I what I do is copy the custom thumbnail I created for my video and make that a clickable image that takes them directly to my video! This is similar to collaborating but you could provide a guest post or guest video to your blogger/entrepreneur friends! No only will this get you more viewers but it will help out your friends by adding video to their site. Because we all know by now, video will boost your SEO! By setting your newest video as your channel trailer, every time a non subscriber comes to your channel your most recent video will play automatically! This is essential because Youtube will ultimately rank you video in search results based on the amount of views and interaction you get the first week it's live. So the easier you make it for people to watch, the more views you are going to get! Psst... Click on this image to save it to your Pinterest!